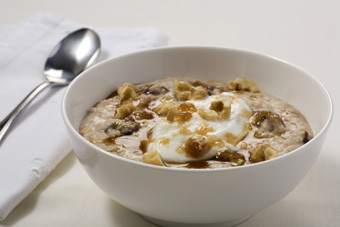 Combine the oats, dried cherries, apple juice, cinnamon, and salt in a microwave–safe bowl. Cook on P10 for 2-3 minutes, stirring every 30 seconds until thickened. Top with yogurt and sprinkle with brown sugar and walnuts.